The decision to launch nuclear weapons is political, not military. As North Korean supreme leader Kim Jong Un declares that "The Entire US Territory Is Now Within Our ICBM Range", somewhere in the Pentagon, operational plans to neutralize North Korean nuclear and long-range missile capabilities are being refined. There are undoubtedly two sets of operational plans: one deploying conventional weapons, and the second for deployment of nuclear weapons. Nothing personal, Mr. Kim Jong Un, it's just business. A core duty of planners in the Pentagon is to ask "What if" and draw up a range of scenarios and operational plans to carry out the civilian leadership's policies and decisions. One such scenario is "what if North Korea launches a ballistic missile that is tracking to strike U.S. territory?" One response option in this scenario would be to wait and see if the North Korean missile hits the U.S. and if it is armed with a nuclear weapon, and if so, if the warhead detonates. Another option is to respond immediately with a nuclear strike that neutralizes North Korea's ability to launch any more nuclear-armed missiles. The U.S. Armed Forces does not declare war or make the decision to launch a nuclear strike--that is the prerogative and responsibility of the nation's civilian elected leadership. The duty of the U.S. Armed Forces is to be prepared to execute the decisions and policies of the elected civilian leadership. The ethical considerations of such a decision are not the Pentagon's purview--those considerations rest with the elected civilian leadership. If North Korea is poised to kill 2 million Americans, South Koreans, Japanese, etc., then isn't erasing North Korea's capability to kill millions at the cost of 50,000 North Korean lives in a limited nuclear strike the more ethical choice? Those considerations are not part of operational plans. The purpose of operational plans is to get the assigned job done. Limiting civilian casualties might well be part of the assigned mission. But it's not the Pentagon planners' job to make those mission decisions. There are no small nuclear explosions, but there are smaller explosions and variations that have profoundly different consequences. Ground-burst detonations carve out craters and send shock waves through the earth that crumple tunnels, bunkers, elevator shafts, etc. Ground-burst detonations generate vast quantities of radioactive particles. Since it's well known that North Korea has buried its most precious nuclear resources deep underground, ground-burst detonations would be the only way to disrupt the access routes to bunkers deep underground. Air-burst nuclear detonations generate field effects, i.e. electromagnetic pulses across the spectrum. These can be "tuned" to some degree. Thus a neutron-type weapon is designed to sicken and kill enemy soldiers while leaving buildings and equipment intact. This might be the weapon of choice to neutralize any attempt by the North Korean Army to launch a devastating artillery attack on South Korea in retaliation for the destruction of North Korea's missile and nuclear capabilities. Air-burst field effects often include massive disruption of electronic equipment. 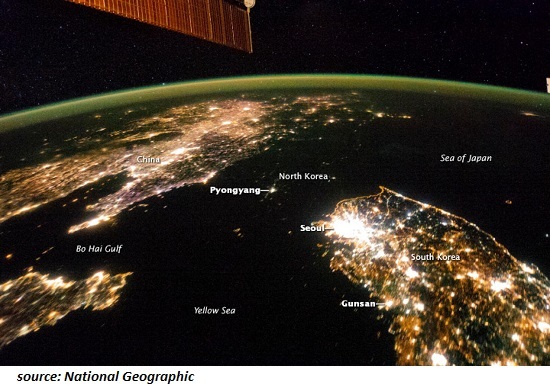 This might limit the operational plans for air-burst nuclear detonations near the DMZ, as technologically advanced South Korea might well suffer significant economic losses from an air burst near the border with North Korea. By the same token, an air-burst nuclear detonation over North Korean military communications headquarters might be considered essential to disrupt the North Koreans' command and control capabilities. My point here is that operational plans to decapitate North Korean nuclear and ICBM capabilities exist and are constantly being revised and refined in light of new intelligence. It's not the planners' job to make the geopolitical or ethical calculations that inform such a drastic decision. It's the planners' job to make sure a strike ordered by the elected civilian leadership of the nation achieves its goal, i.e. eliminates North Korea's nuclear and missile delivery capabilities completely. It's easy to say nuclear weapons should never be used, but what if conventional weapons can't do the job, or create greater risks? Would you consider it a good ethical trade-off to wait for millions to die before killing thousands? That's a political choice, and one that will always be second-guessed or disputed. But making such decisions is the purpose of elected civilian government. The planners job is much more direct. 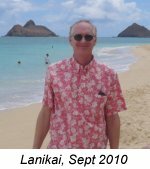 If the elected civilian government orders the neutralization of North Korea's ability to kill millions of civilians in South Korea, Japan or the U.S., then the job boils down to aligning existing resources and reckoning how many resources will be needed to get the job done in the most effective way available. A conventional-weapons strike would likely require hundreds (and possibly thousands) of aircraft sorties, and all that such a monumental effort entails. It would also requires a significant amount of time to execute. A nuclear strike requires far fewer resources but has consequences far beyond those of conventional weapons. There have been no nuclear weapons detonated with the express intention of destroying civilians since 1945. The stakes are high, and nobody wants to launch a nuclear attack unless it is in retaliation for a nuclear attack. But by then it's too late to save the millions killed by the initial attack. We all hope deterrence works. 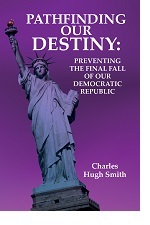 But deterrence very nearly failed a number of times in the Cold War between the USSR and the US. Given the possibility that deterrence might fail--over-ridden by a commander with launch authority, or a dozen other possibilities of miscalculation or impulse-- plans must be made for a first-strike designed to neutralize a nuclear missile capability. The decision to launch nuclear weapons is political, not military--but achieving the goal is the duty of the military. It's nothing personal, folks--it's just a peculiar business. Thank you, Patrick Y. ($5/month), for your splendidly generous pledge to this site -- I am greatly honored by your support and readership. Thank you, Jay S. ($5/month), for your superbly generous pledge to this site -- I am greatly honored by your support and readership. The key to broadly distributing opportunity and capital is to nurture the source of social capital: the community economy. We all know what a hyper-financialized economy looks like--we live in one:central banks create credit/money out of thin air and distribute it to the already-wealthy, who use the nearly free money to buy back corporate shares, enriching themselves while creating zero jobs. Or they use the central-bank money to outbid mere savers to scoop up income-producing assets: farmland, rental properties, etc. This asymmetric wealth accumulation and avoidance of risk creates a self-reinforcing feedback loop, as the super-wealthy financiers and corporations use a slice of their income to buy political protection of their income streams, creating cartels and quasi-monopolies that are impervious to competition and meaningful regulation. The only possible output of a hyper-financialized economy is rapidly increasing wealth and income inequality--precisely what we see now. What we need is a social economy, an economy that recognizes purposes and values beyond maximizing private gains by any means necessary, which is the sole goal of hyper-financialized economies. Given the dominance of profit-maximizing markets and the state, we naturally assume these are the economy. But there is a third sector, the community economy, which is comprised of everything that isn’t directly controlled by profit-maximizing companies or the state. What differentiates the community economy from the profit-maximizing market and the state? 1. The community economy allows for priorities and goals other than maximizing profit. 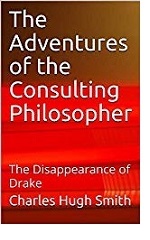 Making a profit is necessary to sustain the enterprise, but it is not the sole goal of the enterprise. 2. The community economy is not funded by the state. 3. The community economy is locally owned and operated; it is not controlled by distant corporate hierarchies. The money circulating in the community stays in the community. 4. The community economy is not dominated by moral hazard; the community must live with the consequences of the actions of its residents, organizations and enterprises. The community economy includes small-scale enterprises, local farmer’s markets, community organizations, social enterprises and faith-based institutions. Its structure is decentralized and self-organizing; it is not a formal hierarchy, though leaders naturally emerge within civic and business groups. Few Americans have worked on a plantation. 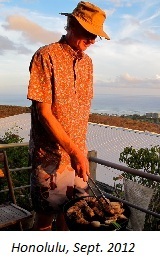 I am likely one of the few who has lived and worked in a classic plantation town (Lanai City, circa 1970; I picked pineapples along with my high school classmates as a summer job). In my analysis, the current financial system is akin to a Plantation Economy:highly centralized and hierarchical, devoted to maximizing profits for distant owners, a finance-fueled machine for extracting wealth from local economies. The corporate Plantation’s low wages leave many of its workers' families dependent on state aid to survive, and so it prospers on the backs of taxpayers who subsidize its low wages and the externalization of costs. The current system rewards those with access to cheap capital and the power of the state. The community economy has neither. 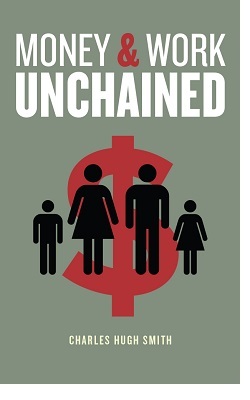 The Plantation Economy institutionalizes poverty, parasitic finance, externalized costs, moral hazard (since the corporate/state overseers do not live in the community being cannibalized) and centralized wealth and political power.These are the only possible outputs of the hyper-financialized Plantation Economy. Once the Plantation Economy has displaced the community economy, opportunities for work and starting small enterprises shrivel, and residents become dependent on state social welfare for their survival. 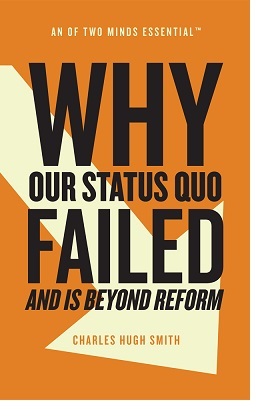 By eliminating the need to be a productive member of the community, the welfare state destroys positive social roles and the inter-connected layers of the community economy between the state and the individual. When the individual receives social welfare from the state, that individual has no compelling need to contribute to the community or participate in any way other than as a consumer of corporate goods and services. State social welfare guts the community economy by removing financial incentives to participate or contribute. Why is the community economy so important? The community economy is first and foremost the engine of social capital, which is the source of opportunity and widely distributed wealth. Corporations offer a limited version of social capital--for example, meeting a manager in another department at a company picnic--but most of this capital vanishes once an individual leaves the company (or is "right-sized" into unemployment). This social capital is only superficially embedded in a place and community, as corporations routinely move operations in pursuit of their core purpose: expanding profits. Corporations cannot replace communities for the simple reason each organization has different purposes and goals. The sole purpose and goal of a corporation is to expand capital and profits, for if it fails to do so, it falters and expires. The purpose of a community is to preserve and protect a specific locale by nurturing social solidarity: the sense of sharing a purpose with others, of belonging to a community that is capable of concerted, collective action on the behalf of its members and its locale. Political scientist Robert Putnam has described this structure as a web of horizontal social networks. Unlike corporations and the state, community economies are horizontal networks, i.e. networks of peers connected by overlapping memberships and interests. It is not accidental that the current system of hierarchical corporations, banks and the state increases inequality and erodes the community economy: the only possible output of low social capital is rising inequality. Putnam identified a correlation between the inequalities enforced by oppressive elites (slavery being the most extreme example) fearful of the potential of egalitarian (horizontal) networks to organize resistance to their exploitation. Areas with low social capital are characterized by limited social mobility and rising economic inequality. In other words, the only way to lessen economic inequality is to nurture the horizontal peer-to-peer community economy that creates social capital. This makes sense, as communities stripped of social capital offer limited access to the other forms of capital needed to launch local enterprises and construct ladders of social mobility. A vibrant community economy provides members with an infrastructure of opportunity, i.e. multiple pathways to building capital, gaining knowledge and connecting with others. The key to broadly distributing capital and reversing inequality is to nurture the source of social capital: the community economy. 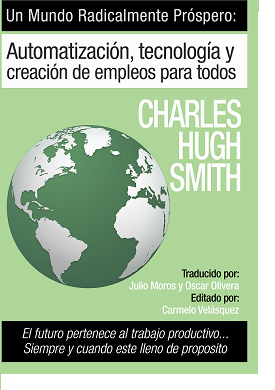 This essay is drawn from my book A Radically Beneficial World: Automation, Technology and Creating Jobs for All: The Future Belongs to Work That Is Meaningful. Thank you, Caitlin R. ($5/month), for your splendidly generous pledge to this site -- I am greatly honored by your support and readership. Thank you, Jonathan M. ($5/month), for your superbly generous pledge to this site -- I am greatly honored by your support and readership. Those who have pushed the risk down the wealth-power pyramid are confident the Federal Reserve will continue to limit the risks of speculative financialization. One of the most pernicious consequences of financialization is the shifting of risk from the top of the wealth-power pyramid to the bottom: those who benefit the most from financialization's leveraged, speculative credit bubbles protect themselves from losses while those at the bottom of the pyramid (the bottom 99.5%) face the full fury of financialization's formidable risk. Longtime correspondent Chad D. and I recently exchanged emails exploring how the higher debt loads and higher interest payments of financialization inhibits people at the bottom of the wealth-power pyramid (i.e. debt-serfs) from taking risks such as starting a small business. But this is only one serving of financialization's toxic banquet of risk-related consequences. Chad summarized how those at the apex of the wealth-power pyramid protect themselves from risk and losses. At the top levels of the pyramid, members in those groups collect way more interest than they pay out and at the very top, they get a ton of interest and pay little to none. The people at the top can take all sorts of risk, because of this dynamic and further, they also usually have a heavy influence on the financial/political machinery, so they get bailed out by taxpayers when their investments go bad. In addition, because their influence extends to the criminal justice system, they are able to commit fraud and at the same time neutralize regulators and prosecutors, thereby escaping any ramifications from their excessive risk taking and in many cases massive fraud. As Chad observed, the wealthy own the income streams from debt (bonds, etc. ), while everyone else owes the interest and principal due on debt. 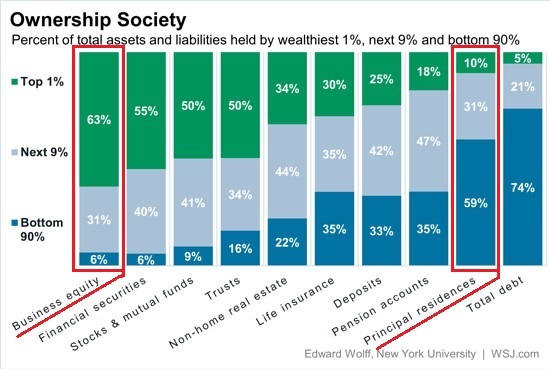 As this chart shows, the wealthy own business equity and financial securities and have a modest slice of debt. The bottom 90% owe most of the debt, and their primary asset is the family home-- an asset that doesn't generate income while it generates interest income for those who own the mortgage. In other words, it's less an investment than a form of consumption-- especially when the current housing bubble deflates. The asymmetry of risk and exposure to loss resulting from financialization is about to become consequential. 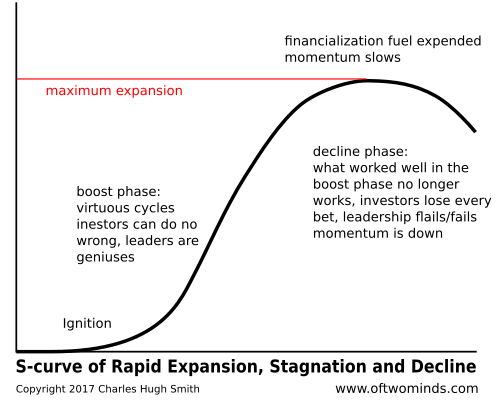 Financialization has reached the top of the S-curve and is now in the decline phase. As noted on this graph, what worked so effortlessly in the boost phase of financialization not only no longer works, it actively boosts the risks of sudden, catastrophic losses. Those who have pushed the risk down the wealth-power pyramid are confident the Federal Reserve will continue to limit the risks of speculative financialization. The S-curve is a pattern of Nature. If you're confident the Fed is now the ultimate power in the Universe, then you're betting that the Fed and Treasury will always absorb all the risk and all the losses, with zero consequences. The S-Curve suggests that bet isn't as low-risk as those at the top of the wealth-power pyramid currently believe. Thank you, David H. ($20/month), for your outrageously generous pledge to this site -- I am greatly honored by your support and readership. Thank you, Michael B. ($5/month), for your superbly generous pledge to this site -- I am greatly honored by your support and readership. If you study these charts closely, you can only conclude that the US economy is doomed to secular stagnation and never-ending recession. The stock market, bond yields and statistical measures of the economy can be gamed, manipulated and massaged by authorities, but the real economy cannot. This is espcially true for the core drivers of the economy, real (adjusted for inflation) household income and real disposable household income, i.e. the real income remaining after debt service (interest and principal), rent, healthcare co-payments and insurance and other essential living expenses. 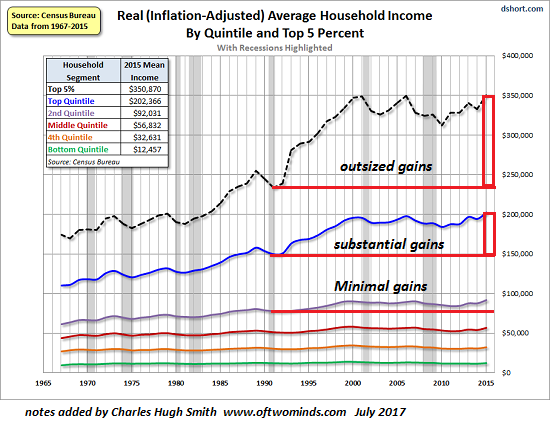 If you want to predict the future of the U.S. economy, look at real household income. If real income is stagnant or declining, households cannot afford to take on more debt or pay for additional consumption. The Masters of the Economy have replaced the income lost to inflation and economic stagnation with debt for the past 17 years. They've managed to do so by lowering interest rates (and thus lowering interest payments), enabling households to borrow more (and thus buy more) with the same monthly debt payments. 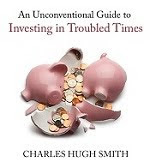 But this financial shuck and jive eventually runs out of rope: eventually, the rising cost of living soaks up so much of the household income that the household can not legitimately afford additional debt, even at near-zero interest rates. For this reason, real household income will dictate the future of the economy.If household incomes continue stagnating or declining, widespread advances in prosperity are impossible. The Masters of the Economy have played another financial game to mask the erosion of real income: inflating speculative asset bubbles to boost the illusion of wealth, a form of financial sorcery called the wealth effect: households that see their stock and bond funds swelling by 50% to 100% in a few years are emboldened to believe this phantom "wealth" is permanent and thus can be freely spent in the present. The gains since 1992 reflect the national distribution of wealth very closely: those with minimal financial wealth (the bottom 80%) experienced minimal gains in real income. Those with some financial wealth (the top 20%) enjoyed substantial gains, but the truly outsized gains were reserved for the top 5%, the class that owns the majority of the nation's wealth. The problem for the Masters of the Economy is that adjusted for inflation, even the incomes of the top 20% and 5% have gone nowhere in the 21st century. If even those households exposed to the enormous gains of this century's two asset bubbles (2002 to 2008 and 2009 to the present) have stagnated, then all the financial shuck and jive isn't trickling down to real income, which is the bedrock of the real economy. 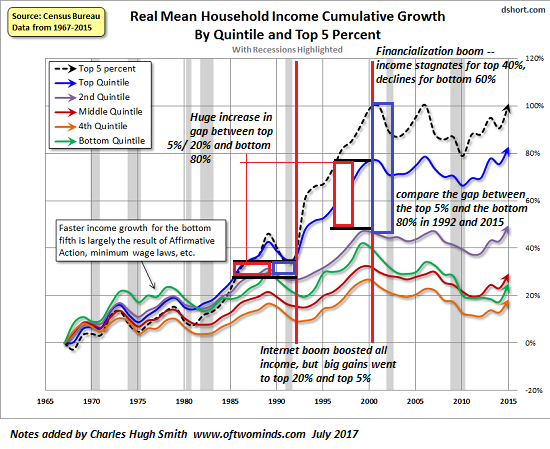 This second chart from Doug Short reveals the period in which the top 20% pulled away from the bottom 80%, and the top 5% pulled away from the bottom 95%. 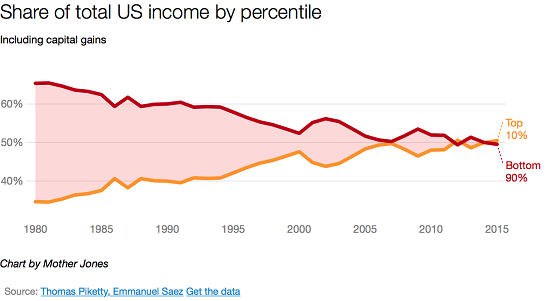 In 1990-92, the gap between the bottom 80% and the top 20% and 5% was modest. The go-go decade of the dot-com boom saw the income of the top 20% pull away from the bottom 80% and the income of the top 5% leave the bottom 95% in the dust. All that changed in the Financialization Era of 2000 to 2015. Despite two unprecedented asset bubbles, the inflation-adjusted incomes of the top 40% have at best returned to the levels of 2000, while the real incomes of the bottom 60% have fallen dramatically since 2000. Please note that this data is from the U.S. Census Bureau. Many of the charts one finds on the web (see an example below) of income/wealth inequality are drawn from data collected by Piketty et al., which as many critics have pointed out, does not include government transfers and social welfare programs that are a substantial (and rising) share of household income for the bottom 60%. These include earned income tax refunds, Medicaid healthcare coverage, rent subsidies, direct welfare payments, subsidized school lunches, direct grants for higher education, and so on. Anecdotally, the sum of these social welfare transfers can double the effective income of low-income households from $20,000 to roughly $40,000 or more. We can quibble about the total value of these transfers and benefits, but they are undeniably substantial and when included, more accurately reflect the real-world income available to lower-income households. It's also necessary to include capital gains, i.e. income from invested wealth and speculative gains reaped from asset bubbles. Data collected by Piketty et al. includes capital gains. The point here is that no source of data on income disparity captures all these income streams or equivalents of income. I prefer to rely on I.R.S. tax records as the most reliable and least gamed source of income data, but the I.R.S. doesn't tax Medicaid benefits, rent subsidies, etc., so it seriously under-represents the effective income of lower-income households. That said, the incomes of the top 20% are mostly taxable and thus more accurately reflected in the data presented here. If you study these charts closely, you can only conclude that the US economy is doomed to secular stagnation and never-ending recession as long as real income for all segments is stagnating or declining (other than the top of the wealth apex, i.e. the top .5% of households). Every other economic measure other than real household income is shuck and jive, statistical trickery, or phantom "wealth" conjured into existence by unsustainable credit/asset bubbles. If the Masters of the Economy can't move the needle of real household income for the bottom 95%, they'll end up with a banquet of consequences that extend deep into the social and political orders. Thank you, Donald B. ($100), for your outrageously generous contribution to this site -- I am greatly honored by your steadfast support and readership. Thank you, Mark P. ($5/month), for your superbly generous pledge to this site -- I am greatly honored by your support and readership.